We don't usually cover old-school, passive stereo speakers here at T3, but Britain's Q Acoustics Concept 300 is something very special, as you can see. They come as a complete package, with those remarkable stands, in three very attractive, ultra-modern wood/paint colour combos. The good news is, from what we've heard, they also sound fantastic. The Tensegrity stands are obviously the real draw here, though. As well as looking rather magnificent, the Tensegrity tripod stand 'eliminates radiating sound and reflections for a purer sonic performance'. 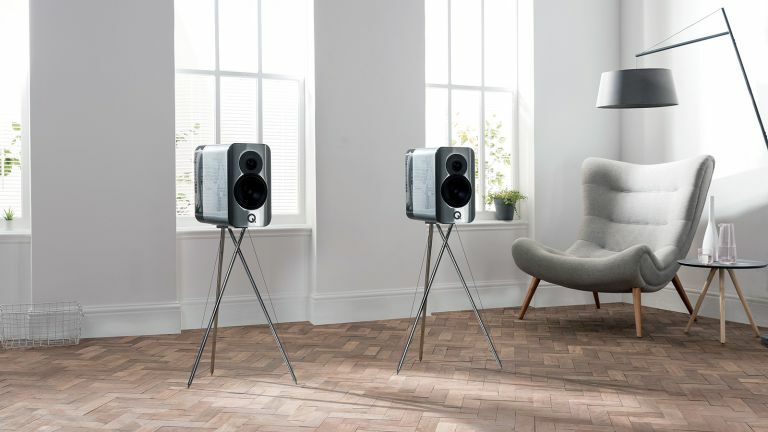 It's constructed from slender, aluminium rods, held in place by a combination of steel cables and the sheer heft of the speakers themselves – each weighs 14.5kg. This means the stands are never subjected to bending force. The other part of the Concept 300's sonics-boosting stability equation is the cabinet's isolation base plate system. This bolts to the stand, and is loaded with four industrial-grade springs, damped with a polyurethane elastomer called 'Sylodamp' – Q Acoustics does like its oddly-named, trademarked, engineering tricks. As we fell in love with this speaker at first look, we were a bit trepidatious about hearing what it actually sounds like. However, during a demo at London's legendary Cornflake Shop, the Concept 300 sounded great, with a wide variety of music from unadorned female voice to banging European power trance. A concern with this kind of hi-fi speaker is it will wimp out when you want it to rock out, but that does not seem to be an issue here. We'll be first in line (for a review sample) when they hit the shops.